On 8th February 2018, the Northern Housing Consortium (NHC) and Housing Associations’ Charitable Trust (HACT) welcomed 82 delegates to its fourth annual social value conference in Leeds. HACT’s Chief Executive Andrew Van Doorn kicked off proceedings by commenting on the significant amount of work that has taken place since the first conference, so much so that we now have a large room full of people who came together solely to discuss social value. “The conversation is moving from demonstrating impact to increasing and driving social impact,” said Andrew. Bronwen Rapley, Chief Executive of Onward Homes and our first guest speaker of the day, delivered an honest and inspirational presentation on why social value is so important to our sector. In Bronwen’s words it speaks to the head and the heart as it helps sustain tenancies and create community cohesion as much as it is a moral imperative and a matter of compassion. Bronwen demonstrated these ‘heart and head’ definitions through infographics with hard data on Onward’s social investment performance and transformative stories from vulnerable tenants about how Onward helped them with issues such as homelessness and hoarding. A focus on the human impact instead of the bottom line continued with Nigel Wilson, Chief Executive of Wythenshawe Community Housing Group, commenting, “the thing that resonates with colleagues is stories of changing people’s lives, not a financial value that no one understands”. 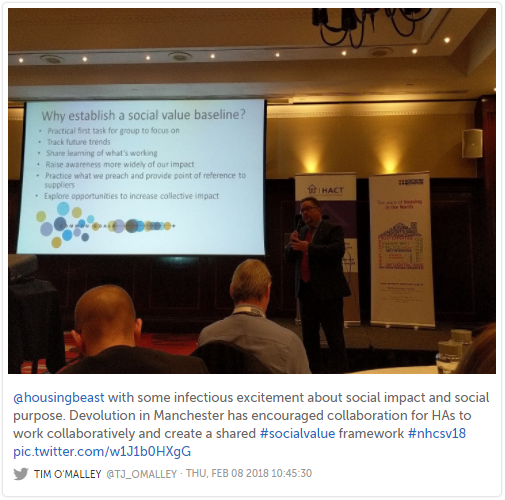 Nigel talked the conference through Greater Manchester Housing Providers’ social value working group that stretched across multiple housing associations. What started as a six-month task ended up creating a permanent committee and setting a baseline for Greater Manchester. Nigel encouraged our delegates to “share what is working and be honest about what’s not working”. The sector could learn a lot by emulating the spirit of collaboration into which the Greater Manchester organisations entered. Next in the list of main presentations was Clarion Housing Group’s session on the power of social value to inform asset management decisions. Alexandra Willey, Head of Regeneration, and Elanor Warwick, Head of Strategic Research, explained how using HACT’s toolkit allowed Clarion to record and demonstrate anticipated social value of a project alongside the financial investment. “Instead of thinking ‘what would a regeneration project cost in financial terms’ we worked out what residents would gain in wellbeing terms over the course of the tenancy”, explained Clarion. For example, there was little social value gleaned from replacement bathrooms and kitchens but projects to clean up dog waste scored highly. Elanor Warwick argued that capturing social value data has to be “bread and butter” to the sector “so we can get on with generating more”. After a lively Q&A sessions in the main hall, and lunch, delegates broke off into workshop sessions. Mears Group’s Group Head for Customer Success and Social Impact, Tracey Lyth, talked us through how social value information can be used to inform dialogue with clients. Newydd Housing’s Community Regeneration Manager, Rachel Honey-Jones, offered the Welsh perspective while Sheila Maxwell, Link Group’s Community Investment Officer, delivered the Scottish context. The second set of workshops brought us Paul Mitchell, Social Value Manager at Efficiency North, detailing how his organisation brings social value impact reports to life. James Williams (Head of Social Impact, HACT) and Ben Carpenter (Operations Manager for Social Value UK) gave guidance on how to make your organisation’s data information believable in an informative Q&A session while Su Pickerill, Wates Group’s Community Investment Manager, delivered advice on how to maximise impact in the local economy. Guestblog: Ward Hadaway – Housing Sector Forecast 2018 Is planned maintenance value for money?